A few years back I was still scared to death of The Haunted Mansion, and now I gleefully recite the script along with the Ghost Host as he guides me through the Mansion. Wanna join me on the ride real quick? Come on... join me! They have all, retired here to the Haunted Mansion, actually we have 999 happy haunts here, but there's room for one thousand. Any volunteers?? If you should decide to join us, final arrangements, may be made at the end of the tour. Swiss Family Treehouse - Disney already has tree houses. Pirates of the Caribbean - Who wants to have to invoke the right of parlay while they're on vacation? Spaceship Earth - What if you get stuck in the Ice Age section of the resort?! Tower of Terror - That could be fun, but I sure wouldn't be getting on the elevator! Living with the Land - I decided that one was lame, but I do like how Garden Grill rotates through it, so I'll happily go back to eat there again. So that left me with The Haunted Mansion. Can you imagine rooms and buildings they could have? Not to mention the pools and recreation areas! I bet some Imagineers could take this idea and really run with it. Ideally the common areas would not be too creepy, so guests with small children could enjoy the resort without their children being too fearful. The pool would be the perfect place to pay homage to the Stretch Room. The pool would be a wade-in pool so it went from very shallow to deep. At the deep end would be a tall water slide themed around the drop from the attic, and there would definitely be a hidden wedding ring in the pavement somewhere. The kiddy pool and splash zone would have a sea captain's crypt in the middle to splash water periodically. Other busts would randomly spit water. Marble busts and tombstones would, of course, be scattered throughout. 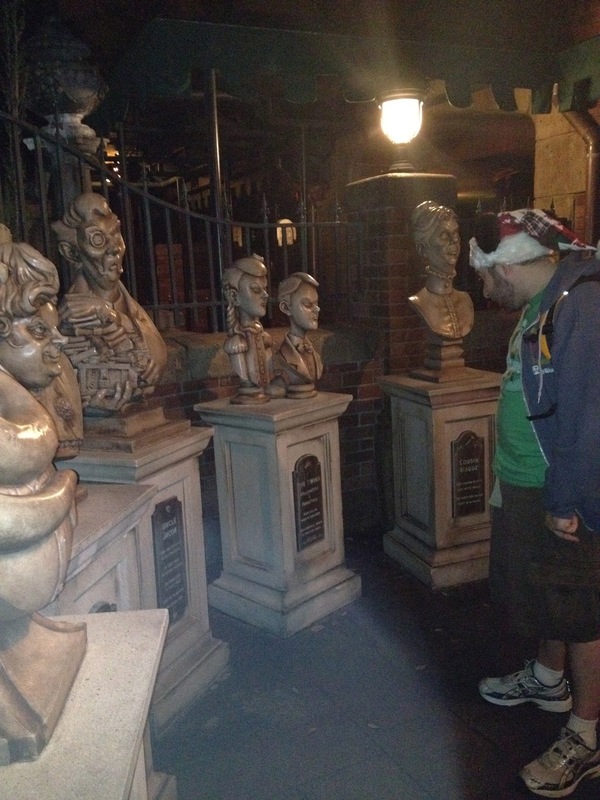 The busts and tombstones would lead guests through various series of riddles like the busts in the interactive queue area. The food court would be themed around the dining/party scene complete with illusions of ghosts partying throughout. Picture chandeliers and an organ playing constant Disney music. Rooms could have special effects windows that as you passed certain ones, ghosts would appear to watch you or follow along. You could stay in various rooms themed like the mansion with details pointing to which husband/wedding the room represents. Other rooms could be reminiscent of the seance room with floating tables and lamps (all illusion and practice though). Rooms could be a bit lighter in spirit (see what I did there?) by focusing on the more jovial parts of the Mansion like the ballroom dancing spirits and hitchhiking ghosts. There's so much that could be done with this! The one part of the resort I can't quite figure out is the food court area. I keep envisioning rotting food, and that just wouldn't do! Even fake cobwebs and dust would be a bit gross. So what do y'all think? At a Haunted Mansion Resort, what would the food court be like? I love all your ideas on this resort, great choice.I love all the ideas for the different rooms and the pool. I don't know about the food that is tricky It could be scary yet really tasty.. I would love it if they made a Haunted Mansion resort. I like the idea of special effect windows and ghost stories each night. Great post! I would most definitely love staying at a Haunted Mansion resort! Love all the details you laid out! Love this post and your great ideas! How about playing around with the playfulness of the ghosts for the food court? Perhaps have the ghosts wage a "ghost" food fight. Or have them play silly food-related pranks on each other in the picture frames on the walls. When that concept art for HM rooms at Port Orleans were floating around, we were ready to pay whatever Disney asked for one of those rooms!